In a medium saucepan over low heat, combine all of the ingredients and whisk well to incorporate. Cook the syrup for 10-15 minutes until reduced by half, whisking frequently to prevent burning. Once reduced, remove syrup from heat and strain to remove cinnamon and cloves. 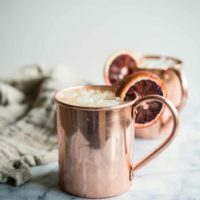 In a copper mug, combine 2-3 tablespoons prepared syrup, whiskey, and ginger beer, stirring well. Add ice, and garnish with a blood orange slice.